Real Madrid have reportedly jumped to the front of the queue to sign PSG midfielder Adrien Rabiot on a free transfer. Manchester United have been strongly linked with the France international, who is set to leave the Parc des Princes this summer – with a trio of other Premier League clubs also keen, including Liverpool, Chelsea and Tottenham. Recent reports had indicated that the 23-year-old had already signed a contract at Barcelona ahead of a move this summer, although his mother, Veronique, denied those rumours. However, she did admit in an interview with L’Equipe that her son has been made something of a scapegoat at PSG and that “they attack him” because of his refusal to agree to a new deal. 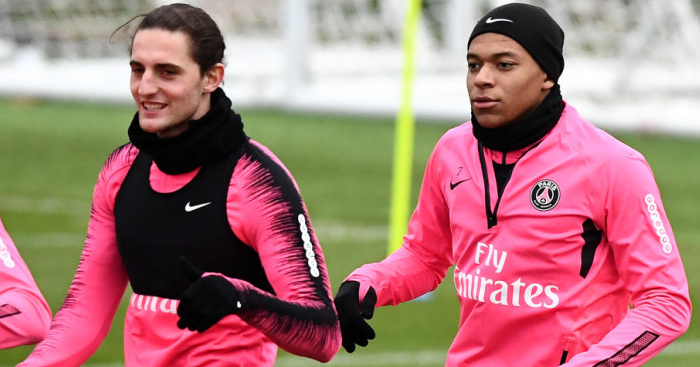 Rabiot has not played for the Ligue 1 giants since the start of December and it would appear that his future in Paris looks doomed. The midfielder had been the subject of interest from Zinedine Zidane last summer before he decided to leave Real Madrid after winning three consecutive Champions League titles. But now that Zidane has returned to The Bernabeu, AS claims that Real are ready to renew their interest in the player. The report goes on to add that the midfielder ‘could have an agreement signed with Madrid’ while ‘his elegant style and quality are to Zidane’s liking’.